I've heard a lot of good things about water/methanol injection systems for forced induction cars so I decided to get a kit for myself to test it out while waiting for the forged internals to arrive. The car is still lying at the garage now as Speedworks only managed to sent the coilovers back from servicing yesterday. There are reasons why I chose AEM over other brands like Snow Performance. 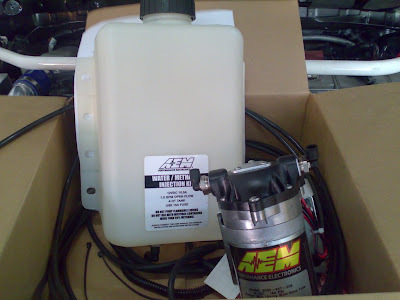 The tank low level indicator feature and the progressive pump is standard in the AEM kit whereby Snow Performance requires you to purchase them separately. Together with the Okada Projects coils, hopefully it'll give us some good results when the car is ready for dyno tune. All Snow performance kits come with a low level sensor. The pumps are all progressive being controlled through the Variable Controllers. 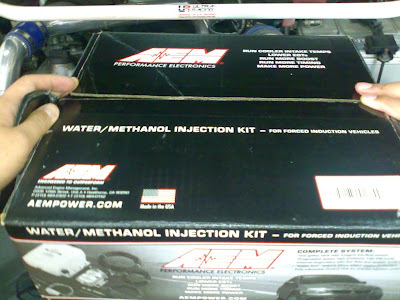 Snow perfromance kits all come standard with a pump that is rated at 20PSI higher than even their closest competiter. The technology in a snow kit is by far the best in the market. nopes, you got it wrong. the stage 1 standard kit injects a fixed amount, it doesn't do variable and there's no level sensor. so if you want variable, u need to purchase anything higher than stage 1. AEM comes standard with progressive and low level. there's no such thing as stage 1,2,3 or whatsoever. hi bro, may i know where did u place ur nozzle? just b4 the throttle body right?